Yes, I know there's a lot happening this week. If you want to hit "Closer Than Ever" at Eureka College tomorrow, Irene Taylor's "Suppos'd to" at Eaton Gallery on Wednesday, opening night of "The End of the Tour" at Heartland Theatre on Thursday, the reading to commemorate the release of David Foster Wallace's "The Pale King" at Babbitt's Books on Friday, the third night of Stephen Karam's "Speech and Debate" at ISU's CW 207 on Saturday, and the closing performance of David Auburn's "Proof," directed by and starring Rhys Lovell, on Sunday, you could experience six straight nights of the arts. Cool, huh? 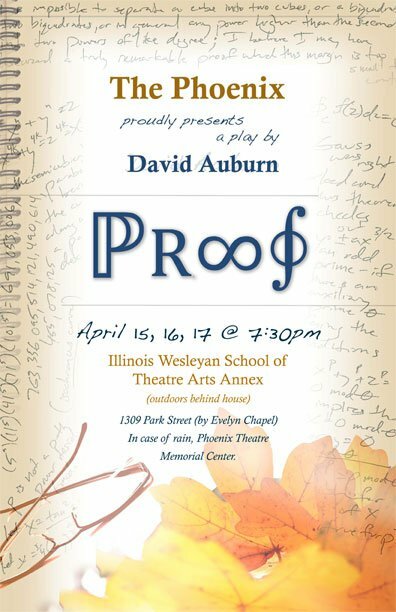 Whichever night you go -- Friday the 15th, Saturday the 16th or Sunday the 17th, with all three performances at 7:30 pm -- this particular "Proof" is a good bet. It's an audience-pleaser of a play, with a Tony Award for Best Play and even a Pulitzer Prize to its credit, and Lovell is consistently excellent as an actor, leading me to believe he'll know what to do with the role of the brilliant mathematician who is very unsure of his mental stability. He'll be backed up by Britta Whittenberg, Marlee Turim and Michael Holding as his character's daughters and a possible love interest of one of them. If you're like me, the terrific recent production of "Proof" at Heartland Theatre is still fresh in your mind, which gives you the opportunity to compare, contrast and really dig into the critical art of theater-going. 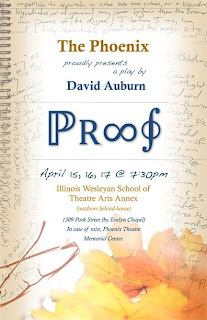 The IWU Phoenix production of "Proof" is free, staged outside in the back yard of the IWU Theatre Annex, which means it's up to you to dress appropriately for alfresco conditions and seating is limited. For more information, click here.